Viewers of the new Jurassic World movie are being left traumatised after one scene in particular. The Jurassic Park/Jurassic World franchise has had its fair share of memorable scenes. With intense attack scenes, heartwarming relationships and the exploration into the wonderful world of dinosaurs gone wrong, Jurassic World is as good an action film as any. This time, Jurassic World: Fallen Kingdom is taking on an emotion rarely utilised in the franchise – sadness; with a tear-jerking scene featured as the movie draws to a close. The film shows some of the movie’s main stars, namely Owen (Chris Pratt), Claire (Bryce Dallas Howard), and Franklin (Justice Smith), onboard the last boat from Isla Nublar, making their escape from one of the fictional islands the dinosaurs have inhabited before it’s destroyed in a volcanic eruption. As they float out of harm’s way, one of the gentle dinosaurs, a giant brachiosaurus, can be seen on the edge of the dock, left with no escape from the destruction of the volcano. The dinosaur has to simply wait for its inevitable death. While undoubtedly sad, the film’s director J.A. Bayona explained there is a good reason for the story of the poor, stranded dinosaur. The lone brachiosaurus is used to take audiences back to the original Jurassic Park movie, as the first type of dinosaur introduced in the original was the brachiosaurus. The dinosaur was introduced to John Williams’ epic Jurassic Park theme tune, announcing the arrival of the dream that was Jurassic Park. Bayona wanted to get the power of this emotional scene across to his actors for Jurassic World: Fallen Kingdom, and so used the theme tune to get his stars in the right frame of mind. I played a very sweet and a little sad version of the Jurassic Park melody. So that was very effective for the actors, especially for Bryce. Being there, telling that story, listening to music from John Williams, they were all very emotional. Bayona’s scene definitely had the desired effect, as Jurassic World fans are left in despair at the dinosaur’s desperation to escape. Jurassic World: Fallen Kingdom makes a point of creating empathy for the dinosaurs, as with the relatable relationship between Chris Pratt’s character Owen and the intelligent velociraptor Blue, who was introduced in the first Jurassic World. 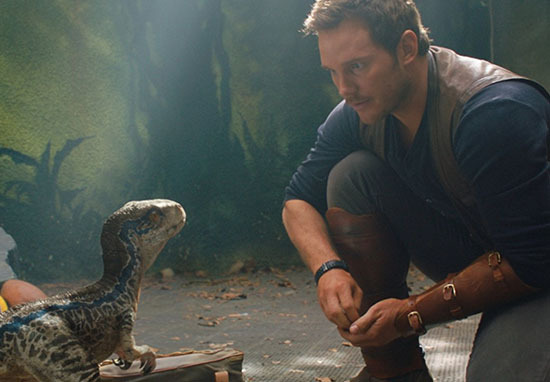 Colin Trevorrow, who directed the first Jurassic World, described the relationship between Owen and the dinosaur as similar to a person with their pet. People really connected with the idea of a human and a raptor connecting with each other, like most people do with their pets. It’s amazing what the power of computer animations can do to our hearts. Jurassic World: Fallen Kingdom is in cinemas now.